Inciting Event: Harry sees Draco looking suspicious in Diagon Alley and follows him to a shop, where Harry believes Draco is being inducted as a Death Eater. This is a relatively vague Inciting Event, since viewers have no idea what’s happened, only that something has. But this late in the series, we also have a pretty good idea what’s going on, thanks to the larger context, so it does what it needs to do to prompt the necessary tension and expectation. First Plot Point: Once at Hogwarts, Harry is asked by Dumbledore to let Professor Slughorn“collect” him as a prize student, so Harry can gain information about Voldemort. Harry discovers an old textbook belonging to the “half-blood prince” and uses it to gain knowledge about potions, among other things. First Pinch Point: Harry and his friends discover another student, who is nearly killed after being hexed into trying to deliver a deadly necklace to Dumbledore. Harry realizes the culprit is Draco, even though no one else will believe him. Draco is the throughline in this story, and this neatly emphasizes his antagonism—despite his own fears and inadequacies. Midpoint: After overhearing an admission from Snape that he vowed the “unbreakable vow” to protect and help Draco, Harry visits the Weaseleys for the Christmas holiday. While there, Death Eaters attack and destroy the Weaseley House. Harry and the others return to Hogwarts, grimly determined to take action. Harry presses forward with Dumbledore’s plan to extract memories from Slughorn. Second Pinch Point: After Ron is nearly poisoned—in another attempt upon Dumbledore—Harry pursues Draco. Using a spell from the half-blood prince’s book, he nearly kills Draco’s. 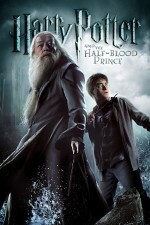 Third Plot Point: Harry finally gets Professor Slughorn to share the memory of Voldemort’s descent into dark magic. He and Dumbledore watch the memory and learn that Voldemort split his soul and enspelled it in seven different horcruxes—which must all be discovered and destroyed before he can be killed. In itself, this moment is actually a victory, since it allows Harry and Dumbledore to discover what they must do to defeat Voldemort. But it works as a low moment, in that it is also a horrifying discover of Voldemort’s true strength. Climax: After Harry and Dumbledore return with what they believe is one of the horcruxes, Draco lets Bellatrix and the other Death Eaters into Hogwarts, while he goes to the astronomy tower to try to work up the courage to kill Dumbledore. Climactic Moment: Snape joins the Death Eaters and blasts Dumbledore off the tower, to his death. Although we see it only clearly now, the threat to Dumbledore’s life has been at the heart of the conflict all the way from the Inciting Event, when Draco was charged with killing him. Thus, the conflict—and the story—ends here. Resolution: Harry discovers Snape is the half-blood prince. After the students honor Dumbledore’s death, Harry discusses his plans with Hermione and they decide to hunt down the horcruxes. As Harry Potter begins his sixth year at Hogwarts, he discovers an old book marked as "the property of the Half-Blood Prince" and begins to learn more about Lord Voldemort's dark past. Directed by David Yates.